Habitus of Eucatops sp., from Peck & Cook (2005). Scale bar = 1 mm. Contains: Leiodini, Agyrtidae, Cholevini, Ptomaphagini, Leptodirini, Dissochaetus. The Leiodidae are mostly scavenging or fungivorous beetles, often found in decaying organic matter; a number of species are known from caves. They are diverse in body form but can mostly be recognised by the form of the eighth antennal segment, which is smaller than the seventh and ninth segments on either side of it. Perhaps the most modified in form is Platypsyllus castoris, an ectoparasite of beetles with a flattened body and reduced eyes and elytra. Characters (from Lawrence & Britton 1991): Moderately small beetles with more or less spiny legs and usually simple tarsi, abdomen usually entirely concealed by elytra. Antennae eleven-segmented, usually with five-segmented antennal club, second segment of club (antennal segment 8) smaller than either first or third, club sometimes very weak with antennal segment 8 only slightly reduced, or very strong with 8 greatly reduced or absent, unique internal sensory vesicles usually opening on distal surfaces of segments 7, 9 and 10. Larvae active, campodeiform, urogomphi almost always articulated at base; mandibular mola and two apical maxillary lobes (galea and lacinia) present. [G09] Grebennikov, V. V., & A. F. Newton. 2009. Good-bye Scydmaenidae, or why the ant-like stone beetles should become megadiverse Staphylinidae sensu latissimo (Coleoptera). European Journal of Entomology 106: 275–301. [P90] Peck, S. B. 1990. Insecta: Coleoptera Silphidae and the associated families Agyrtidae and Leiodidae. In: Dindal, D. L. (ed.) Soil Biology Guide pp. 1113–1136. John Wiley & Sones: New York. [P01] Peck, S. B. 2001. 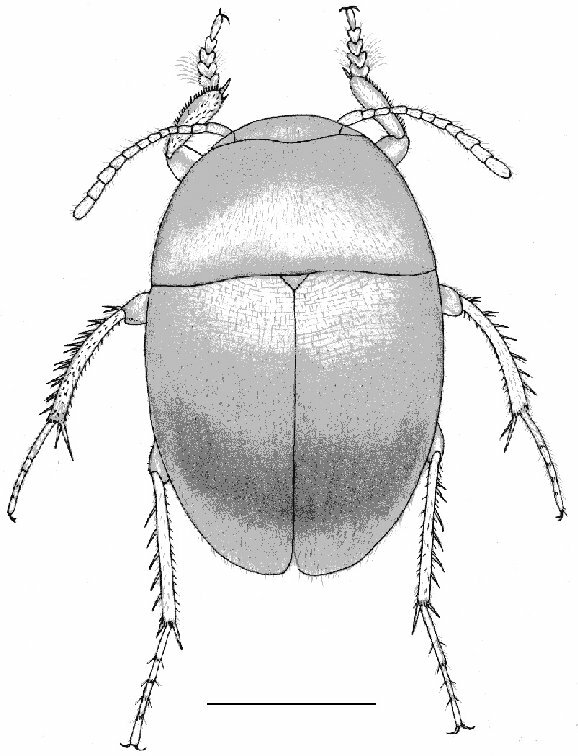 Leiodidae Fleming, 1821. In: Arnett, R. H., Jr & M. C. Thomas (eds) American Beetles vol. 1. 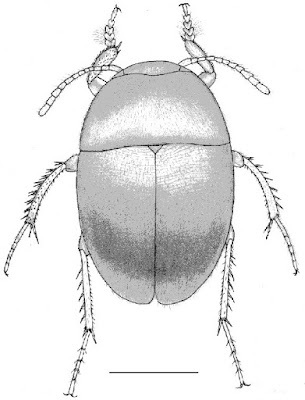 Archostemata, Myxophaga, Adephaga, Polyphaga: Staphyliniformia pp. 250–258. CRC Press: Boca Raton. [S05] Salgado, J. M. 2005. Cholevinae (Coleoptera, Leiodidae) from Ecuador: new data and two new species. Graellsia 61 (1): 51–60. [SP76] Szymczakowski, W., & D. Plath. 1976. Catopidae aus dem Nepal-Himalaya (Ins., Col.) Senckenbergiana Biologica 57 (1-3): 35–48.